Chadwick Matlin at Slate suggests that the shopping mall as a retail environment is finished. Rod Dreher agrees and has interesting reader comments. At the Pueblo Mall, Steve & Barry's barely opened before it was closed again, another story of bankruptcy from a chain store that tried to be everywhere at once. Writes Matlin, "At the risk of getting Gladwellian, every store that closes has an impact on the shops left behind. Walking through a half-empty mall is an unsettling experience; it feels as dreadful as Dawn of the Dead, just without the zombies." I never heard the term "pimple-collar job" before, but it's obvious. Begin with a driverless Jeep Liberty with an iffy parking brake left in neutral (my fault). Add gravity, snow, oak brush, and a gully. Let simmer for two hours. I'll be providing their champagne for New Year's Eve, to be sure. Buried in a Colorado State Parks plan for more trails at Lake Pueblo State Park lies--surprise!--a plan to collect more fees from park visitors. That's right, all you mountain bikers parking at the "red gate" and other access points on Colorado 96, the parks bureaucrats want some money out of you. One official trailhead with parking, trail information signage, and a self-service pay station may be considered along Highway 96 at the area know as the “red gate”. The parkies want to tag you too. Day use and seasonal passes should become available to the trail user. A receipt and wire tag system similar to systems used by the Forest Service or ski areas could be used and displayed on the bicycle or horse while riding in the park. By accepting and paying the fees, the user is expected to follow trail etiquette and release the State of Colorado from liability. Because there is nothing more important in being outdoors than liability issues. M. and I went for a walk in the Mason Gulch Burn today. It was a sort of "edge day" for weather -- a storm to the west, clear skies to the east, and us right on the boundary. Part of the time it was sunny, while at other times fingers of snow squalls reached for us, and the skies clouded over, as in this photo. These mule deer does were feeding back in the shadows ... ... and so were some little dinosaurs, a/k/a wild turkeys. Me, I wonder if Santa might have a better telephoto lens left over in his bag. Labels: deer, fire, Mason Gulch, Wet Mtns. Just a reminder: Your 2008 Colorado small-game or fishing license is good through March 31, 2009. I like that change because it forestalls setting out the first week of the year and then remembering, "Uh-oh." The new licensing year will be April through March. • We drove home from Florence today in graupel. M., who grew up in the Hudson Valley, says she never saw it before she arrived in Colorado on a November day. It's falling right now on a sun crust, with actual snow forecast for this afternoon and tonight. • Bill Schneider rips into TV hunting shows. I don't have cable (not available here) nor satellite TV, so I don't see these, but from my outdoor-writer days I am aware of the pressure to "get the story" or to impose a narrative on what is an unpredictable hunting or fishing experience -- and the abuses and falsification that can result. • Mungo assembles a list of bushcraft and nature blogs, including 18th-century trekking and Dynamite Skills, which is not about explosives. • Sawtooth goes hunting and muses on being more "crunchy" than "bubba." You open a Western antiques shop in an old house on East Main Street in Florence, which is zoned commercial. 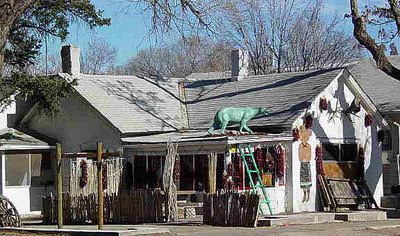 You think, "A bear on the roof would really draw 'em in," but you don't have a large bear sculpture, and, face it, the chainsaw bears are so last-century. But you come across a taxidermist's form for a gigantic bear, and so you bolt it to the roof. It's still a bear, although it lacks ears and teeth and makes the passer-by think of a prehistoric bear that has spent centuries in a glacier, losing its fur in the process. Yes, I already knew that the Virgin Mary was fond of spinach. I learned to cook partly from George Herter, as my tattered copy of Bull Cook and Authentic Historical Recipes and Practices will attest. I think about Herter now and then. Thanks to Steve Bodio for the catch on this Herter review essay. Read the whole thing. Sometimes when I am bouncing over the snowy ruts of our road in my rattletrap Jeep CJ-5, wind tearing at its soft top, I think, "I need a really butch 4x4. This one's too comfortable!" You can still get parts for an M-37. That might fit the bill. Or what about a UAZ 469? Yeah, Russki iron! Note the passenger's hold on his door. Does the UAZ 469 lack a Jesus bar, and is that because the USSR was an officially atheistic nation? The Cañon City Daily Record profiles district wildlife manager Bob Carochi. 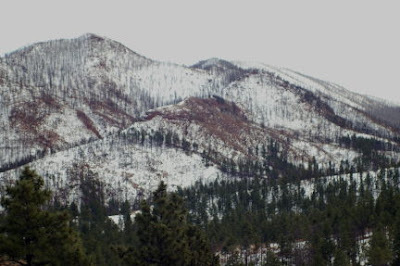 Instead of falling into spring, summer, autumn and winter, his seasons divide into antelope, elk, deer and bear. Never one to punch the clock, Carochi works long hours and even longer days — sometimes, chalking up more than 300 hours in a single month. He also works many holidays. According to the Denver Post, Senator Ken Salazar will accept the post of Secretary of the Interior. At least we hope that under Sec. Salazar there will be less political meddling in scientific research. Via Cat Urbigkit, a report on the usual conflicts over proposed wolf reintroduction in the Southern Rockies. WildEarth Guardians recently petitioned the U.S. Fish and Wildlife Service to develop a wolf recovery plan for the region. Re-establishing a population of the carnivores is crucial to bringing ecosystems back into balance, according to the group. Not surprisingly, the Colorado Cattlemen's Association feels otherwise. Coincidentally, M. and I were watching "Wolves in Paradise," a PBS program about livestock producers and (or versus) reintroduced wolves in an area north of Yellowstone National Park. One rancher who spoke hopefully of "detente" and coexistence with the wolves still ended up having his employees shoot a couple -- and later calling in the federal "wildlife services" people to take out some more. The program offered no happy ending for everyone. A little off-topic for this blog, but I wanted to share this link about abandoned sites in Antarctica and nearby islands. For obvious reasons, Antarctica is a very popular place to abandon. For once, read the comments. Ah! The electric coffee grinder. 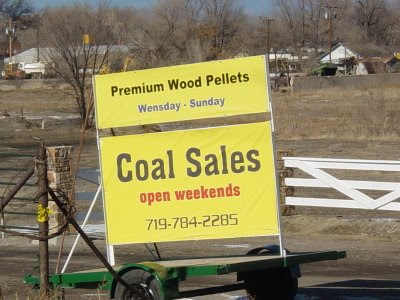 The Associated Press reports that prices for recycled materials are plummeting. Cardboard that sold for about $135 a ton in September is now going for $35 a ton. Plastic bottles have fallen from 25 cents to 2 cents a pound. Aluminum cans dropped nearly half to about 40 cents a pound, and scrap metal tumbled from $525 a gross ton to about $100. In Washington state, what was once a multimillion-dollar revenue source for the city of Seattle may become a liability next year as the city may have to start paying companies to take their materials. And when that happens, the cynics who just want to beat up on environmentalists go, "See, we told you! Nyah nyah nyah." "It's going to be bleak for a while," he said. "We can just make our piles taller, and hopefully by spring, things will be a little better." Under new regulations, persons with valid concealed-carry permits may now possess weapons for self-defense in national parks, under the laws of the state in which the park is located. In other words, if I enter Mesa Verde National Park, I am still under Colorado law, not suddenly under a different, federal law. [W]e also recognize that current statistics show an alarming increase in criminal activity on federal lands managed by the Department of the Interior, especially in areas close to the border and in lands that are not readily accessible by law enforcement authorities. In other words, the feds cannot guarantee your safety in parks along the Mexican border where drug smugglers, etc., run freely, as well as in some other parks with crime problems, e.g. Yosemite. If national parks were crime-free, park ranger Nevada Barr's career as a mystery writer would never have taken off. Yet the National Parks Conservation Association (NPCA), a nonprofit supporting the National Park Service, is treating this news like a disaster. Simply put, concealed-carry permit holders are not the people that they have to worry about in regard to crime and poaching. These permit holders have gone through training classes, fingerprinting, and criminal background checks in order to get their permits. They are as close to Grade A law-abiding as you can get -- yet the NCPA wants to treat them all as potential criminals. I can see two reasons for NPCA's agitation. One is simply fear of change. The other is ignorance. Neither reflects well on the organization. With all the talk comparing today's economy to the Great Depression, I have noticed that one other event of the early 1930s is being celebrated as well -- Repeal Day! There is a connection between Repeal, the election of Franklin Roosevelt in 1932, and the Democratic Party's adoption of "Happy Days Are Here Again" as its official song. The Southern Colorado Beer Examiner has the history, but let me add that Pueblo, Avondale, and St. Charles Mesa saw a lot of illegal distilling and bootlegging too back then, a legacy that lingers in some people's minds. You can read all about that in Betty Alt and Sandra Wells' Mountain Mafia - Organized Crime in the Rockies . Last month I went to Stink Onion. That's just one Midwestern place name that looks startling fresh in the Atlas of True Names, which you can preview at the Telegraph's web site. Middle Earth’s evocative “Midgewater”, “Dead Marshes” and “Mount Doom” are strikingly similar in nature to Europe’s “Swirlwater”, “Darkford” or “Smoky Bay”, as revealed by the Atlas of True Names. Names are fun to think about. My September trip to North Dakota brought me back through places I knew from childhood with their flint-hard native animist names--Spearfish, Sundance, Bear Lodge--mixed with the names of military commanders who subdued those same animists--Sturgis, Sheridan, Fort Collins. They made a change from the baroque Catholic religiosity of New Mexico and southern Colorado place names. I belong to what is, in effect, the Blood of Christ Shooting Sports Club. Translated, it sounds like something from Franco's Spain! 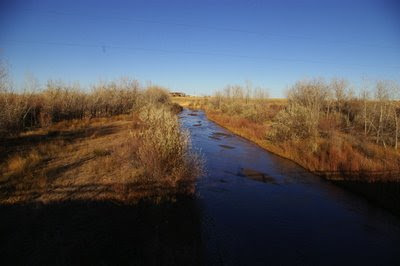 This what a High Plains river looks like: the Huerfano River in southern Pueblo County, flowing northeast towards the Arkansas River. Looking upstream to the southwest. Looking downstream towards the northeast. 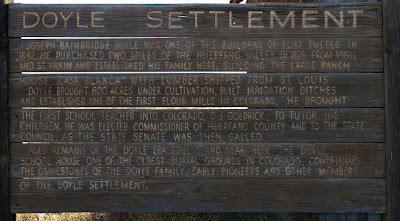 An historical marker near the bridge where the photos above were taken. Click the photo for a more readable image. Yes, in Colorado this stream counts as a "river." It only goes dry occasionally. In May it might be rambunctious, during the snow melt. Some tamarisk and Russian olive removal needs to be done here, as in so many places. If all this talk about cooking potatoes, oatmeal, and split peas is getting you down, here is an unvarnished review of many canned and prepared foods. Have you noticed how most of the pundits touting Colorado oil shale as our energy salvation live east of the Mississippi River? I'm talking about you, Glenn Reynolds, there in soggy Tennessee. They just do not understand the water issues wrapped up with the shale issues. You can't just snap your fingers and create more than 300,000 acre-feet of water in the over-appropriated upper Colorado River basin, as the Colorado Independent explains. “A dominant finding is oil shale development, along with its associated power production, could require tremendous amounts of water, up to 378,300 acre-feet annually,” concludes the Energy Development Water Needs Assessment, which was funded by grants from the Colorado Department of Natural Resources and the Colorado Water Conservation Board. So if you take the water for shale development, which ox gets gored? Denver? Las Vegas? Los Angeles? Phoenix? UPDATE: Welcome, View from the Porch readers. For more education on Western water issues, visit Coyote Gulch. 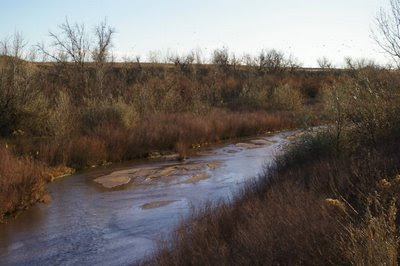 To see what we mean by "river" in the Southwest, go here. At least according to the designers at Alpha Industries.